1.) I graduated from college. This, in itself, is a miracle. When I started college, I was 18 and very sick with anorexia. In my heart of hearts, I did not believe I would live to see many more years, and neither did anyone else. Two years into my college career, I checked into a treatment center and began working my recovery in a serious way. The fall after I got out of treatment, I moved to Denton, fully planning on being a teacher and marrying my then boyfriend. Oh, then he broke up with me and crushed my world. I somehow managed to crawl forward, as the Lord brought many new friends and lots of healing into my life. I wanted to quit school because I kept failing, sometimes I would be shocked, sometimes I saw it coming, and one time it was because I thought I dropped a course, but somehow there was a mix up. The whole time, I knew I wanted to move to Honduras, where I could teach without my degree. I cried many times as I fought through class, and eventually changed my major. Then, I failed out for an entire semester, so after that I really was determined to quit. So, finally, last night, I was able to say that I finished something I started and I graduated from college. Miracle!!! 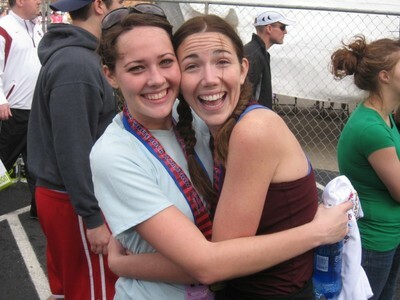 2) I ran my second half-marathon. 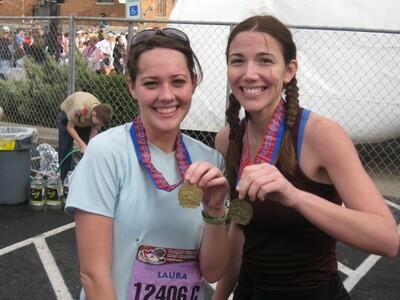 My best friend, Laura and I ran in the White Rock Half. I ran in a time of 2 hours 3 minutes, despite the wind! It was a good run, and a nice way to prepare for my first marathon in February.